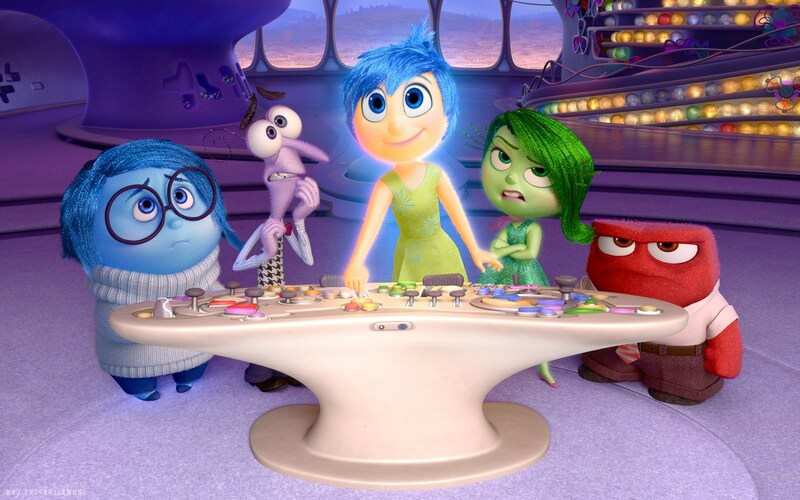 The Pixar film Inside out gives an amusing look inside the head of a girl growing up to be a woman. Mindfinda gives you three reasons to go and watch this Pixar movie. I will even throw in a bonus reason! Imagine this: You are a perfect 11, maybe 12-year-old. School is nearly finished, leaving you a bit anxious about starting highschool after the holidays. And then, out of nowhere your parents tell you the family will be moving. It happened to me. It probably happened to you. And it happens to Riley in Pixar: Inside out. But Pixar’s Inside out is about more than a symbolic initiation ritual into the cold hard grown up world. Riley moves from the cold Minnesota where she had a warm childhood and many friends into the warm, but colder San Francisco. Colder because she has no friends in this new world. You get an inside the mind view of emotions behind the control board in our headquarters. Fear, Anger, Disgust, Sadness and Joy. Joy is our heroine in the film (click to see the trailer). All emotions are represented by a symbol. Joy is a star, Sadness is a teardrop, Fear is a raw nerve, Disgust is a broccoli (my kids hated broccoli when they where little so I can understand that very well). Anger is a fire brick. Dreams play a part in this movie too. In dream time, Riley’s memories get stored into long-term memory. There is a Dreamland in her mind were a script gets written, there are fake memories and we all love the unicorn walking around theer. Movie posters dedicated to common dream themes like “Flying”, “I am falling into a pit” and “Something is chasing me” are hanging on the wall. Click here to see. The thing I love most about this film is the Train of thought (click to see the trailer). When Riley looses Joy from headquarters (remember how said you could feel during puberty?) this train of thought plays a vital role. Pixar has been very clever in resolving the quest for a new life. Two things have to be done. First the childhood toy has to sacrifice himself to put Joy back into headquarters. And in the second place: opposites must acknowledge each other. Joy and Sadness find out they need each other. Isn’t that what growing up is about? Finding, restoring and maintaining a sense of inner balance? And finding out that our extraverted heroine Joy has a sidekick-heroine in Sadness? Don’t we just love to sing the blues and reminisce about the good old days? Cry about all that is lost, drink a whiskey and move on? This is the extra bonus reason: it is a very good entertaining and lovable film.